This is part 2 in an ongoing series that uses data to show selective media coverage. A version of this post was originally published on Priceonomics. Sign up to be notified of future posts. See previous posts here. What would you think if the majority of media coverage that a Middle Easterner read about America focused exclusively on American drone strikes and Guantanamo Bay? After all, this would be newsworthy and relevant for the Middle Eastern reader - and something they want to read. And yet, this is just selective coverage that gives the reader a dangerously distorted view of the US, fanning anti-Americanism. As one Muslim pointed out on Twitter after the New Zealand mosque attack, Muslims were under attack around the world. But she neglected to include any examples where radicals who followed the Islamic faith attacked others. In the same way, let’s see how an American newspaper (The New York Times) covers terrorism, and show that this selective coverage can give us a distorted sense of the world using actual data. In short: media is data for human decisions, and selective media is selective data. Just like we saw last time with the Space Shuttle Challenger, selective data can lead to bad inferences and bad decisions. Selective facts can actually be worse than no facts or fake news, as it can give us a false sense of confidence. With horrific attacks in Paris, Orlando, San Bernardino, Brussels, and Berlin, there has been wide coverage of the threat posed by radicalized Muslims in the last two years. For example, this is an animation of how the Orlando nightclub shooting was covered on The New York Times website over several days, with a substantial number of articles about the attack. After looking at the news coverage, are you afraid of terrorism? What about mass shootings? Does it make you want to change your life in any way? What would you ask of your political representatives? First, let’s look at terrorism deaths versus homicide deaths. At left, we have the actual number of deaths in the US and world, with coverage in The New York Times in the rightmost bar. 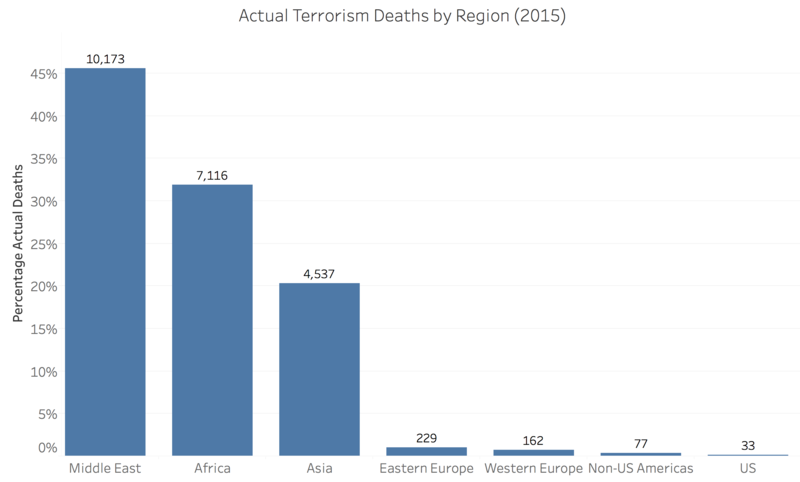 Source: Terrorism data from National Consortium for the Study of Terrorism and Responses to Terrorism (START). (2016). Global Terrorism Database [Data file]. Retrieved from https://www.start.umd.edu/gtd. Custom NY Times analysis for media coverage data, with articles representing the first few pages of The New York Times shown. Homicide data from the CDC and the World Bank. Note: We’ll use a 15-year average for US terrorism deaths, which includes 9/11 in the US. As a result, these numbers will be higher than any single year in the last 14 years – but also less than 9/11. We’ll also use a shorter multi-year average for world terrorism. Front page+ is defined as the first few pages (~3) of The New York Times, consistent with how an average reader may experience it. Homicides and terrorism deaths have roughly the same number of articles in 2015-2016, despite the fact that homicides killed many more in the US and in the world in that time period. The terrorism coverage would be even greater if we included general articles about terrorism, not just terrorism incidents. Some will argue that the reason for heavy terrorism coverage is because tens of thousands (or more) may die in a future attack - and so heavy coverage of each event ensures our vigilance. Others will argue it is because terrorism evokes more reader interest and terrorists purposefully design their attacks to get heavy coverage. Regardless of the reason, terrorism deaths are the single most heavily covered type of death per capita in the first pages of The New York Times compared to nearly every other way a human can die. Approximately 30,000 people – most of them innocent civilians – lost their lives to terrorism in 2015, with the majority in current war zones (Iraq/Syria and ISIS, Nigeria and Boko Haram, Afghanistan/Pakistan and the Taliban, Ukraine and ethnically Russian separatists/special forces). Most deaths were in Muslim countries, suggesting that many victims were Muslim (you can also see this world map of incidents that I’ve put together). Source: NY Times Today’s Paper links for 2015 with manual tagging and custom analysis (the top two sections - h3 and h6 HTML tags - were chosen, which are similar to the first three pages of the NY Region print edition). The graph above composes ~180 stories of the ~6,000 stories in 2015. The majority of terrorism death stories above are on the front page, not the second or third page. 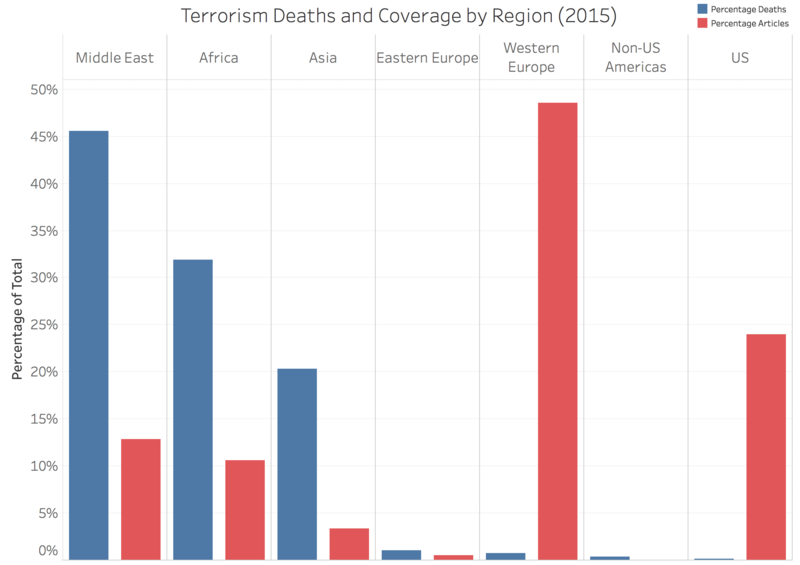 I’ve excluded the Charleston Church shooting in coverage, which some may not consider terrorism - though the START terrorism dataset previously shown includes it. Sources: NY Times Today’s Paper links with manual tagging and custom analysis. National Consortium for the Study of Terrorism and Responses to Terrorism (START). (2016). Global Terrorism Database [Data file]. Retrieved from https://www.start.umd.edu/gtd. Part of the difference may be due to different definitions of “terrorism” and how war deaths are less covered than general war events, though this will likely only impact the magnitude of the skew not the presence of it. 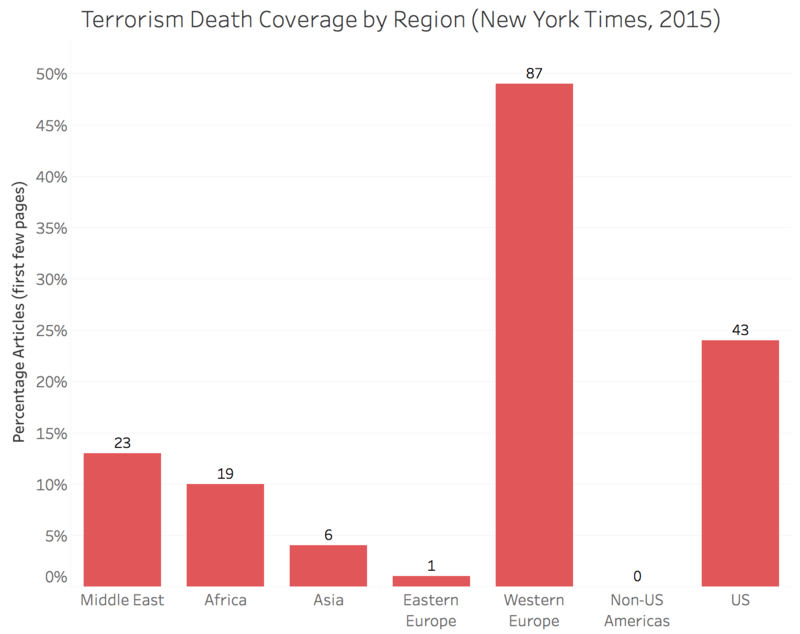 The graphs are nearly inverted: Less than 1% of terrorism deaths are in Western Europe and the US, while 70%+ of terrorism death coverage on the first few pages in The New York Times is of these events. This is what media observers call a filter bubble or echo chamber. The audience’s preference for certain “newsworthy” and “relevant” topics (and lack of interest in others) will then give us a distorted view of the world. We’ll call this effect the invisible hand of the reader and examine it throughout this series. I won’t argue that media should cover events as the blue bars. By focusing on events that don’t interest their audience, news outlets and social media companies would in fact be diminishing their readership — and their profits. But humans mistakenly use media coverage to understand what’s going on in the world — instead of realizing how selective this coverage is and making adjustments. Media critics will also argue that “the media” is biased, without realizing the audience and economic forces that underlie much of this. This effect gets even more problematic in social media, where relevance is based on an individual reader’s interests and beliefs - not the more diverse audience within a country. The New York Times editors realize how much interest there is in Western terrorism incidents over everything else for an American audience, and set their coverage appropriately. In journalism parlance, they cover “newsworthy” topics that interest their readers, featuring it heavily and crowding out many other potential stories each day. This is also consistent with the terrorists’ objectives, as they are trying to maximize the coverage they get in certain populations, to intimidate the largest group — and to recruit the largest number of people. While filter bubbles have received substantial interest in the social media era, they have always existed. In the past, filter bubbles were based on your country or social group. Today, because of social media, we are now each surrounded by individualized filter bubbles that can confirm our pre-existing beliefs. This is because we now have the power to determine what media to consume based on what our like-minded friends share. Source: Pariser, Eli. "Beware Online Filter Bubbles", TED Talk (link). And though we’re focusing on terrorism, we’ll show selective media coverage in example after example over this series. 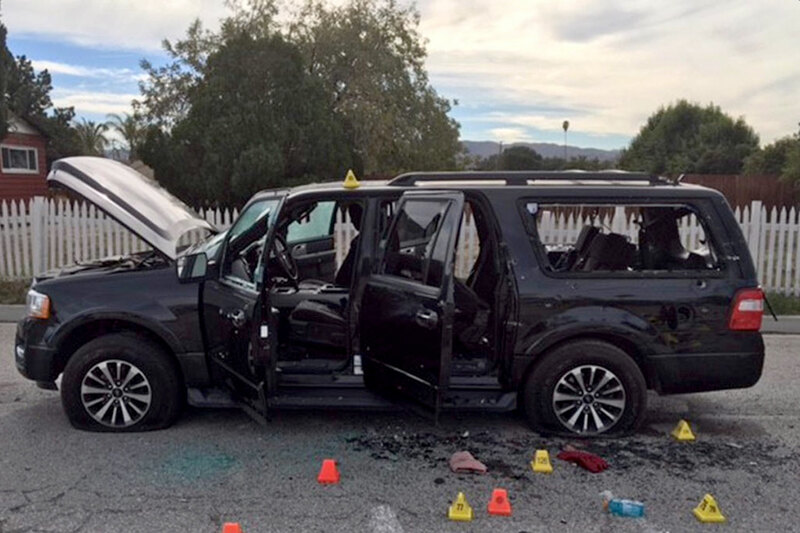 A growing number of deadly terrorist attacks occur in the US and Western Europe, exclusively perpetrated by Muslims against non-Muslim Westerners. There is a war by Muslims against the West. Western Europe, especially France, is an increasingly dangerous region. Terrorism occurs around the world, often in active war zones, with devastating effects on civilians, especially Muslims. Most terrorism deaths occur in active war zones. There are many other dangers to be vigilant against in the West, compared to terrorism – and France is likely one of the safest countries in the world to visit, even the day after a terrorist attack. While we’ve only filled out the inferences, you can reflect on what decisions you might make from the different graphs. How would you think about the danger level when you take your children to school? What thoughts come to mind when you think of all of the 1.6 BN followers of Islam, especially after 9/11? Would you visit France for a vacation? Some argue that uneven coverage is morally wrong (and others disagree), but for our purposes, the issue is that uneven coverage negatively affects our decisions. I began this post by quoting Americans who made major life changes out of fear of mass shootings from rethinking their children’s education plans to refusing to leave home. We can also note the 70% decline in tourism to one French site or the US’s large counter-terrorism budget. Or consider the fact that the drop in US air travel after the plane crashes on 9/11 potentially led to 1,000 more auto deaths in subsequent months. Cars are many times more dangerous than planes, even on 9/11. Like the quotes that started off this piece, you can also examine your own worry level after even a single widely covered terrorism incident. Now reflect on how your anxiety level might contrast if there was minimal coverage of these events. These results become especially worrisome when we consider the impact media coverage has on the world's perception of Americans, as we highlighted at the start. For most Middle Easterners, their perspectives of Americans are driven by media coverage, not personal encounters. If the same selectivity exists for them, they will see substantial coverage of American drone strikes that kill civilians and civilian deaths after the Iraq war (at least one hundred thousand) and blame that on Americans — rather than empathizing with the pain inflicted on Americans by terrorism in the US. We can add other widely covered issues such as Abu Ghraib, Guantanamo, and American military aid to unpopular governments, not to mention continuing bias attacks against Muslims in the US. A Middle Eastern Muslim’s view of Americans may be far divorced from reality. After all, their coverage focuses on these events, rather than giving them a broader and more accurate perspective. The primary way that most Americans are exposed to Muslims is through some form of media as well. Today, most US coverage is of war in the Middle East, terrorism, and radicalized Muslims, especially after 9/11. Ask yourself a few questions: How much have you read about Western terrorism by Muslims? What perspectives do you have of all 1.6 billion Muslims as a result? Would the US coverage be different if Muslims were 10% or 25% of the US population? On the other hand, how much have you read about civilian deaths from US action in the Middle East or terrorism against Muslim civilians? How much do you think a Muslim in the Middle East has read about potentially controversial American activity in the region? How much have they read about recent Western terrorism by comparison - or all the positive impacts America has on the world? Do you think this affects how they perceive all Americans? Throughout this series, I’ll highlight the ways you can contribute to this analysis. 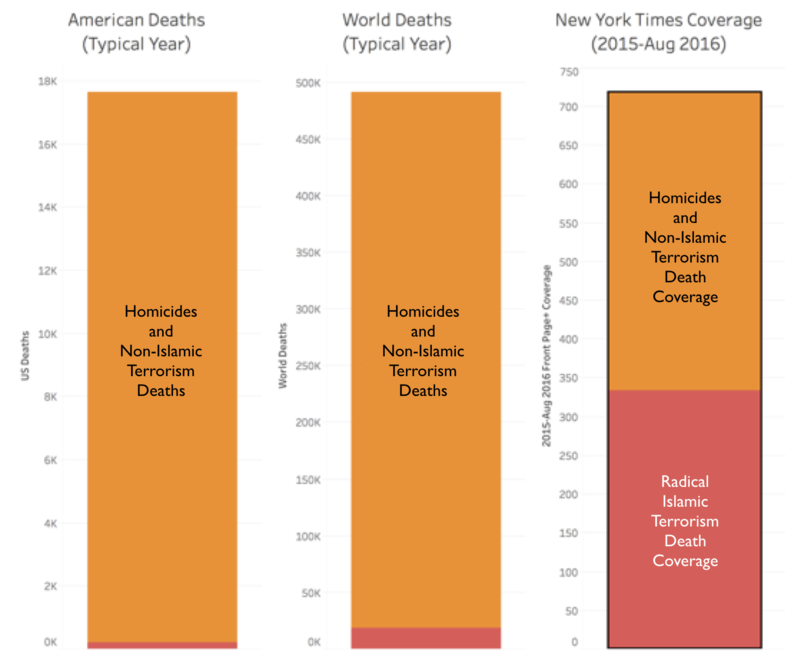 The first suggestion: Pick your favorite news source, and compare how they cover terrorism deaths compared to the actual statistics (available here). For example, you can compare how Al Jazeera or the Times of India or Le Monde or your own Facebook feed covers terrorism incidents by region, compared to the actual data. Would readers of these different media sources make widely different inferences about the world? Do you think the average reader realizes this? With the growth of social media, we can apply this argument for many other groups within a country: Democrat vs. Republican, conservative vs. liberal, Black Lives Matter activists vs. those believing in “law and order”. In each case, a supporter is selectively seeing the media coverage that confirms their views, while not seeing those that are at odds with it. A Clinton supporter may see only racist attacks against minorities in their news feed, while a Trump supporter may only see attacks on Trump supporters. Both do happen. In addition to selective data, as readers we’re over-generalizing our view of the entire other side, based on extreme events or commentary from a select fringe. This analysis is limited in a number of ways — especially because we’ve chosen the first pages of a single media source. But it’s not an unfair representation for how a typical media source covers terrorism in the US. This selectivity for death coverage for similar social and ethnic groups likely exists in all parts of the world — and is a collective challenge for effective decision-making when using media. Pick your favorite media source and think about how you might prove to yourself that it is truly representative and won’t give you a distorted sense of the world. Thirty years ago, NASA managers in the Space Shuttle Challenger launch used selective data to inform a decision that led to the death of seven Americans. The tragic loss also led to an overhaul of NASA’s statistical thinking, reducing the likelihood of future deaths in space travel. Similarly, we’ll see what we can do to fix this distortion as thoughtful readers. This is Part 2 in a series where I look at data to highlight media selectivity. Signup to be notified when the next post in this series is published. If you’re interested in contributing to this non-partisan effort, see some guidelines or contact me (media-analysis at this domain). Thanks to Wayne Chang, Siddhartha Dalal, David Fries, Sima Gandhi, Richard Gurley, Anthony Ha, Nadira Hira, Wei Qing Jen, Shay Maunz, and Josh Nassiri for warm-spirited debates. All views are my own. Don't miss the next post. Sign up to be notified when it's published.